The gift-giving season is here and if, as a grandparent or parent, you intend to purchase a microscope for your kids, then read on. The following information will not only save you money but also keep you from giving the kids a gift that can be the source of more frustration than educational fun. 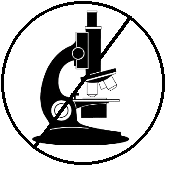 Microscopes, especially the ones sold in the major retail outlets, usually tout the high-power of the product. They often look like the microscope shown above. For kids untrained in microscope use, 50 power (50X) is more than enough magnification. Don't assume kids are being taught microscope skills in the elementary grades. Until kids have been taught how 'field of view' and 'depth of field' affect what's seen through a microscope, observing at higher powers will simply frustrate the kids. In a school system with a good science program, they may learn these skills in middle school. If they don't, let's hope they have a good biology teacher in high school. 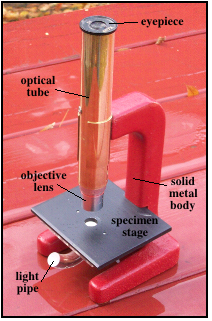 When looking through a microscope, the lens near the eye is called the eyepiece lens and the lens at the other end of the tube, near the object being examined, is called the objective lens. The power of the lens-pair is computed by multiplying the power of the eyepiece lens by the power of the objective lens. These powers are stamped on the barrel of each lens. My favorite microscope, the Brock Magiscope (shown above), has a 10X (10 power) eyepiece lens and a 4X (4 power) objective lens. The magnifying power of the tube is therefore 10X x 4X or 40 power. That’s enough power to see the organisms in a drop of pond water. Remember, the higher the power, the smaller the field of view, the thinner the depth of field, and the more difficult it is to find and view an object through the microscope. A microscope that kids can actually use will provide lots of enjoyable hours viewing minuscule objects like Abraham Lincoln seated in his Memorial on the back of a penny or the fantastic creatures that swim and live in a drop of water. The microscope shown above can be purchased at these web sites. This is something that I have not heard many children ask for in this modern day. So many focus on computers but there is so many little things that is fun to explore with a microscope.